Sorry, I don't have a picture of Bob Eubanks. If you have a picture of Bob Eubanks I can use, please e-mail me at Thegameshowfans@aol.com. The object of Card Sharks is to complete a row of cards by guessing whether each card is higher or lower than the previous card (or base card). A syn. version, hosted by Bill Rafferty, aired along with the CBS version hosted by Bob Eubanks. Each player has their own deck of 52 cards. In the syn. version, prize cards were hidden in each deck. In the 1st and 2nd rounds, 5 cards are dealt from the top of each deck. Unlike the '78-'82 version hosted by Jim Perry, this version had 3 types of questions. The types of questions asked were either a standard 100-person survey, an audience poll of 10 people, or an educated guess question. One player guesses the number while the other player guesses whether the number is higher or lower than the 1st player's answer. If the game goes into a 3rd round, 3 cards are dealt off the top of each deck. When a player wins 2 rounds, they get to play the Money Cards for a possible $32,000! The Money Cards is played like the main game except you bet money on whether each card is higher or lower than the previous card or base card. The deck consists of 52 cards. In the syn. version and the CBS version from Sept. 1986 to sometime in 1988 , 3 jokers were hidden in the deck (which were used for the 1st version of the car game). If you double you money all the way to the top of the Money Cards, it's $32,000! Look at the diagram below to see how the layout looked like. $400 ____ ____ _____ cards were available to use, but you could only $200 ____ ____ _____ use one card on each row. There were 2 versions of the car game. In the syn. version and CBS version from Sept. '86 to sometime in '88, 3 jokers were hidden in the Money Cards deck, and they took the jokers (plus one free joker) and placed them on any of 7 cards, one of them with CAR behind it (see pic above). They try to find that card, and if they do, they win the car. In the CBS version from '88-last episode on March 31, 1989, a 10-person survey question was asked. If you got the answer exactly right, you won the car. If you were off by one, you won $500. In any event, the player got to meet a new challenger. Some information is courtesy of The Encyclopedia of TV Gameshows. Pictures are copyright 1986-1989 The Card Sharks Company. 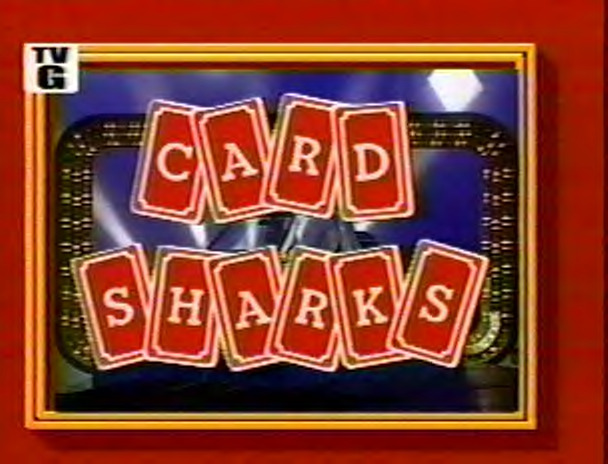 Don't forget to watch Card Sharks weekdays on Game Show Network @ 4:30PM! No copyright infringements or challenge to ownership is/are implied or intended with anything from this site. All copyrighted stuff is property of respective owners. This is just a fan site.